This week Patti has challenged us to share our perspective on a moment in history (read her challenge here). Having recently seen the WWI movie “They Shall Not Grow Old” by Peter Jackson, I thought I might focus a bit on something in the same vein which has had immense importance here in the south, the American Civil War. The war, which lasted four years (1861-1865), resulted in over a million casualties – 3% of the total population at the time. The numbers include soldiers who were killed in battle and the many more who died due to disease (smallpox, yellow fever, dysentery and malaria were rampant in the camps) as well as over 50,000 civilians. The US National Park Service puts the number closer to 2,000,000, as the official record did not count as killed those who were seriously wounded and sent home only to die shortly afterwards. Whatever the actual number, even the lowest estimates account for more American deaths than all other US wars combined. Until the horrors of WWI, the American Civil War was one of the bloodiest wars in human history. Because injuries to limbs most often resulted in gangrene, amputation was the treatment of choice. Many of the field medical personnel were untrained and were completely overwhelmed by the sheer number of wounded at any given time. The injured were sometimes left lying in the field of battle for several days or up to a week before being treated. Many of the combatants were friends or even relatives who fought for different sides – sometimes young teens posing as having reached the mandatory age of 18 and sometimes young girls disguised as young men. 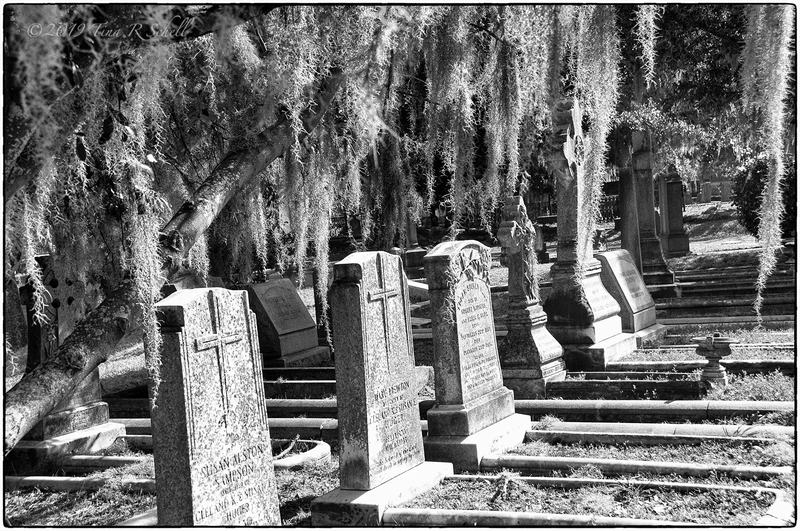 Magnolia Cemetery, located just outside of Charleston, is a final resting place for many Civil War veterans, including hundreds of Confederate soldiers and 5 of their generals. It is incredibly rich with local history dating back to its foundation in 1850. Many of the graves of those long-ago soldiers are still carefully tended, often decorated with Confederate flags and flowers. While we may disagree with their cause, recognition of their courage and commitment is surely their due. 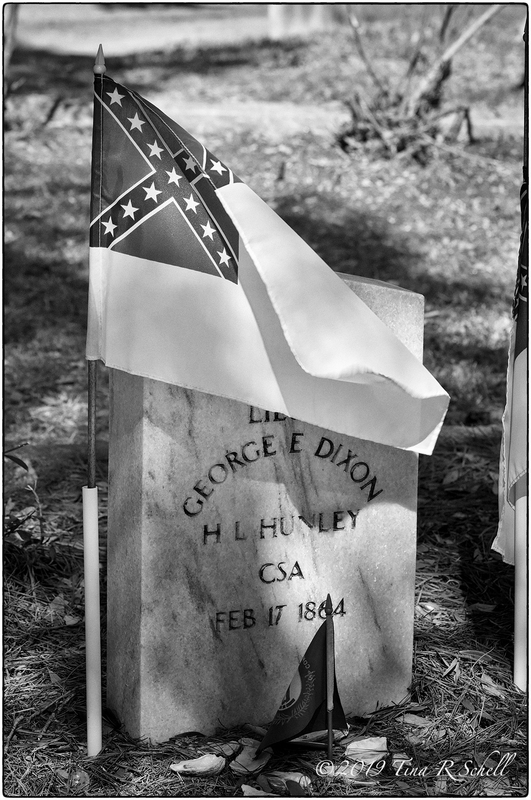 Lieutenant George Dixon, whose grave is pictured above, is quite famous in both local and naval circles as the captain of the H.L. Hunley, the first submarine ever to sink a ship in warfare. The submarine successfully torpedoed and destroyed the Union’s USS Housatonic, but it then sank with all of its crew members aboard. Following years of searching, the sub was found intact at the bottom of Charleston Harbor in 1995 by a team led by adventurer/author Clive Cussler. Archaeologists raised the sub 5 years later, taking it to a special facility where it has been extensively researched. Scientists speculate that the crew (whose remains were found on board) may have died of pulmonary hemorrhage (ie. ruptured lungs) from the shock waves of their successful torpedo’s explosion. I will close with a recommendation that if you haven’t see the Jackson WWI movie you absolutely should. For a photographer, it is fascinating to see how he has transformed the original footage from WWI battles into a present-day technology movie – going so far as to hire lip readers to translate the soldiers’ conversations and coloring the uniforms exactly as they would have appeared. The movie can sometimes be difficult to watch in light of the fact that the images are real-life films that often portray the horrors of war. But I honestly believe anyone who does see it will feel even more deeply the cruelty, inhumanity and senselessness that is war. Thanks to Patti for giving us an opportunity to highlight historic moments both large and small. Hope to see you next week when Ann-Christine hosts Challenge #38.
fabulous post ….love the mystery of the photos & always love your words….very special!! Thanks April. Let’s just say it’s a subject I know only too well! As someone who is dabbling in photography and trying to get better, who majored in history with an emphasis on The American Civil War and Reconstruction and who used to be a Civil War Reenactor (Union cavalry), this wonderful post resonates. During our trips to the East, South and Southeast I’ve always included the CW battlefields; Antietam, Fredericksburg, Vicksburg, Spotsylvania, The Wilderness and Gettysburg. All moving and all somber and all reminders (that we never seem to heed) of the horrors of war; particularly the American Civil War where the technology of war outstripped tactics. Wonderful post and wonderful site. The choice of B&W added, and aided, greatly to your presentation. Well crafted. A couple pieces of trivia. First, regarding the Confederate standard, “Stars and Bars” flag. There were several different versions of the flag that were used by Confederate forces. On the battlefield, both sides ran into difficulty distinguishing between the Union flag and the Confederate flag, which led to “friendly fire” incidents. To reduce the confusion, Confederate forces also used their state flags but they simply added to the confusion of knowing the location of their own forces. In the post-war South, the Confederate flag carried by Lee’s Army of Northern Virginia was adopted copyrighted as the emblem by the United Confederate Veterans (UCV). Two other service organizations, the Sons of Confederate Veterans (SCV) and United Daughters of the Confederacy (UDC), also adopted the Confederate flag carried by the Army of Northern Virginia. At some point, this particular flag was assumed to be the soldier’s flag or the battle flag of the Confederacy. Second, the HL Hunley submarine. During its development, the Hunley encountered many problems. One was the constant leaking; another, it would become quite cold rapidly. If it was used in an operational setting, the mission would likely be one-way. It was presumed they would be detected, the shockwave from the detonation of an underwater explosive device maybe enormous, or would sink due to seaworthiness issues. When the Hunley was recovered and raised, the decision was made the vessel would have to remain in seawater, otherwise it would quickly deteriorate. The remains of the crew, identification was done from a seating chart where each crewmember would be seated. A DNA identification was deemed to be exceedingly difficult since the remains were exposed to seawater. Fittingly, they were buried together with full military honors. Only recently have I begun to learn more about the American Civil War, coinciding with my first-time viewing of Ken Burns’ entire documentary series on the Civil War. While tactics and technology have evolved, there’s a universal brutality and ugliness to war, regardless of the theater’s epoch. I haven’t watched Jackson’s take, but I also recently watched from our province’s state-broadcaster the documentary series called “Apocalypse: World War I”. Thanks for your post, Tina! 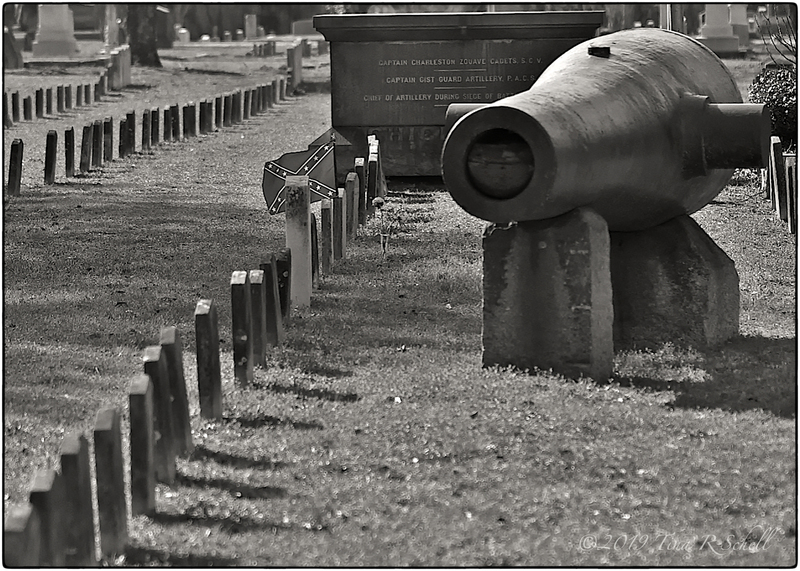 The B&W photos stunning as thet are ctreates a somber feeling as I read your history of Civil War. I will never understand killing at all, war or not. Thank you, Tina for choosing the Civil War for this theme. 3% of the total population at the time… the cruelty of the war. These photos tell the history. A great post. I’ll check out the movie. Your post reminded me Sullivan Ballou Letter to his wife Sarah on PBS. I’m always in tears when I read the last paragraph of his letter. I like your response. I’ve all seen They Shall Not Grow Old, wow, what a beautiful work of film that is. I agree and I listened to a few interviews where he talked a bit about his process and it was pretty fascinating. Everyone knows cruelty, inhumanity and senselessness of the wars, still prepares for them. Not to forget terrorism, suicide bombing, mindless killing in the name of religion. All true Indira, but there is goodness too! Excellent take. You aroused my interest for this movie, would love to watch it. Great post. Is it available online? Only trailers are there. Thanks. I checked online, though it is for free viewing but they ask credit card no. and I don’t have that so hard luck. I will try to check out the WWI Jackson movie. Tina, your images are beautiful and poignant of the dark time in our history when we were so divided as a nation! $2 million, wow! The movie sounds like a good one, thanks for the suggestion! Thanks Terri, the movie is well worth a watch! Thanks Nora. If he’s a history buff he will LOVE it. And as a photographer you will too. Amazing on both counts. We are immersed in Civil War history here. I was a docent at the Stonewall Jackson House for 6 years. It was the only home he ever owned. Great shots as always, love, love graveyards and with your skills – even more! And a good reading too – love the Dixon story. Quotes remarkable as always, my favorite is Einstein. I will be on the lookout for that Jackson piece too, but don’t think it will turn up immediately here. My husband loved your post too ;-D.
Beautiful images. There is an excellent book i read (fiction) written by Irish author Sebastian Barry called “the end of our days’ some of which is set during the American Civil war. I learned a lot about the horrors of that war from it. 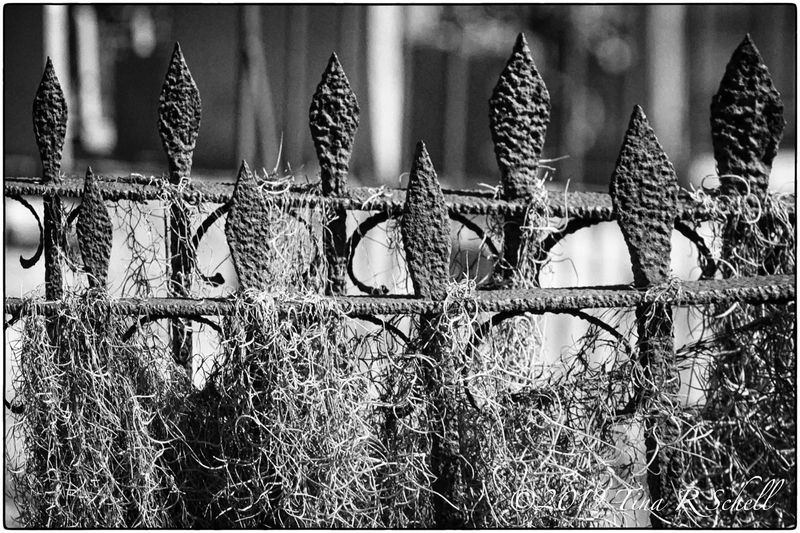 Really enjoyed the story you shared of Lt. Dixon and loved the photo of the “Not Forgotten” fence with spanish moss! Yes, sad but true. We thought we had moved beyond some of this hate, but we obviously haven’t. Tina, heartfelt interpretation of a part of the human condition that is our least honorable trait. Great post, Tina. I agree “They Shall Not Grow Old” was amazing! Poignant photographs and a very good read. Congratulations to you on a superb post. And yes, Peter Jackson’s film is amazing. It just came out in downloadable and streaming form. Thanks very much Michael. I knew it wouldn’t be long but amazing its streaming already! I, too, have seen the trailers in the theater. Looks very worthwhile. I must see if it’s still playing here. Check online John. Someone mentioned it’s now streaming. Again, a great collection of photos. I just watched the trailer of “They Shall Not Grow Old”. It looks very well done. Great post, my friend! We lose the perspective of the horrors of war as our collective memories forget the bad parts and focus on the brave and heroic. After watching They Shall Not Grow Old, I was also amazed at the technology used to bring those WWI films to life for an audience that is used to a higher quality depiction of the world around us.